1. I strongly disagree with the widespread sentiment voiced in last week’s Observer editorial that “doing nothing is not an option.” On the contrary: not only is “doing nothing” very much an option: it’s probably the only sensible option, anyway for now. Any form of western physical intervention now would almost certainly do more harm than good. The participation of the UK in any collective western intervention would be particularly mad. Unilateral British intervention would be sheer criminal insanity. 2. The growing chorus of voices in the mainstream media and the blogosphere which argue that “we” (who, exactly?) have a duty to take firm (i.e. 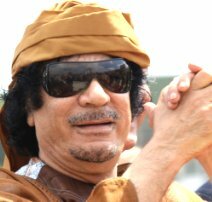 military) action to save the democracy-loving people from Gaddafi’s bombs and bullets, even if there is no authority for intervention from the UN Security Council, is deeply irresponsible and reprehensible. The disastrous failures of the illegal (because not UN-authorised) military adventures over Kosovo in 1999 and Iraq in 2003 should have taught us all a lesson in the need to uphold the rule of law in international as well as in domestic affairs. The Responsibility to Protect (R2P) principles have been approved by the whole UN since 2005 and any attempt at by-passing them in favour of unauthorised military action by NATO, or a ‘coalition of the willing’, or a well-meaning Tory-LibDem coalition, would literally be criminal. 3. Sending a group of SAS “special forces” with “a diplomat” covertly into rebel-held Benghazi on some ill-defined secret mission seems to indicate that someone in Whitehall has been reading too many adventure comics or James Bond stories. No wonder some of them have been arrested. Liam Fox, the defence secretary, told us gravely on television this morning that “we would understand” that he couldn’t tell us anything about this barmy adventure. On the contrary, Secretary of State: having leaked some of the facts to the press, you have a duty to tell us what the hell you’re up to, especially now that it seems to have gone pear-shaped already. When are we going to learn to mind our own business — especially now that our own business is being so catastrophically mismanaged? 4. It’s nonsense for the 50 generals and other assorted defence experts to tell the government to rescind the defence cuts in view of the need for all those ships and aircraft for an intervention in Libya. The utter folly of the cuts being made in the defence budget has nothing to do with Libya: it’s the lunacy of being scared to abandon the British so-called independent nuclear deterrent, thereby saving billions of pounds urgently required for other real needs, when our ‘deterrent’ is not in the least independent and has noone to deter. 5. The LSE’s programmes for training Libyans in the principles and practice of democracy were (or are?) extremely worth-while, especially as they were financed by Libyan oil money and thus were not at the expense of other LSE programmes. The possibility of dozens of future Libyan leaders having spent time in London absorbing western political secular values at the LSE was one that the LSE was absolutely right to seize. Nothing that has happened in Libya since puts the LSE in a bad light. The LSE Director, Sir Howard Davies, should not have resigned. He should be applauded. By the same token, Blair should be applauded (for once) for having established mutually beneficial commercial relations with Gaddafi’s Libya in exchange for Gaddafi terminating his support for the IRA and other terrorists. 6. It’s far from obvious that a significant majority of Libyans want to get rid of Gaddafi. He seems to have substantial support in and around Tripoli where the majority of the population live. Of course it may turn out that so many Libyans want him out that his position will eventually prove unsustainable: but that remains to be seen. The complexities of the Libyan clan system and the fact that Gaddafi, unlike Mubarak, can still rely on the loyalty and support of substantial elements of armed forces of various kinds, make the advocates of intervention on the side of “the people” against “the tyrant” look impossibly simple-minded. We have stupidly referred Gaddafi to the International Criminal Court and thereby lost any hope that the old brute, if once cornered, will flee Libya and seek asylum abroad, so we have only ourselves to thank if he sticks it out to the bitter end and the last drop of Libyan blood, or (perhaps more likely) fights his enemies to a standstill and an effectively permanent stalemate. Or he might even win. 7. It’s much too early to assume that whatever régimes emerge eventually from the current confusions in Egypt, Tunisia, Libya and other countries in the region where popular protests are growing will be any more democratic, peaceful, moderate or committed to human rights and good governance than their predecessors. The new régimes seem very likely to be strongly nationalistic, to incorporate Islamist elements, to be hostile to the west generally and to the United States and Israel in particular, and — initially at least — to be greatly strengthened by the legitimacy that will come from widespread popular support. General liberal rejoicing at the multiplying fall of tyrants is seriously premature. 8. Uncertainties about the future of oil supplies from Libya and perhaps other middle eastern oil-producing countries, especially Saudi Arabia, are already driving up world oil prices to new heights. A new oil shock, coming on top of the still feeble signs of recovery in the west from the crises of the banking collapse and deep recession, seems very likely to push the west back into a new and even more severe recession or even a global slump. If the monarchy in Saudi Arabia seems to be seriously threatened, that likelihood may become a certainty. We’d better hold on to our hats — and drain our tanks. 10. Of course the majority of the leaders of all the major countries involved have an overwhelming interest in averting that kind of Armageddon, and the oil-producers have got to sell their oil to someone. But many of the dangers I foresee are more likely to materialise than not, and if that’s so, the general welcome given by liberal opinion to events in the Arab world in recent weeks may prove to have been hopelessly misplaced. That’s enough unpopular thoughts to be going on with. Don’t all shout at once! Update: On para 3, about the UK’s SAS “diplomatic team” in Benghazi, the panel comment by Jon Leyne inset in http://www.bbc.co.uk/news/world-middle-east-12658054 is an especially hilarious read, although the operation itself looks anything but hilarious and I suspect we’ll be lucky if it doesn’t end in tears, or worse. Update 2 (18:30 6 March): The arrival by helicopter in the dark of the British ‘diplomat’ with his armed SAS protection team, hoping apparently to establish contact with the Libyan rebels, has ended in farce (which is admittedly better than tragedy). Libyan security guards found they were carrying arms, ammunition, explosives, maps and passports from at least four different nationalities, witnesses told the BBC. The SAS team has been released by the understandably suspicious rebels (who might well have shot them as spies) and after a pathetic telephone appeal by the British ambassador to Libya from his gardening leave in the UK, gleefully broadcast on Libyan television and now available on the BBC website, the team has been allowed to leave on board the Royal Navy frigate HMS Cumberland that had docked in Benghazi, presumably to ‘rescue’ it. It’s legitimate to speculate about the IQs of whichever geniuses dreamed up this asinine project, and indeed of whichever ministers presumably approved it. A ministerial resignation to atone for this national humiliation might be in order? Well, it’s a lovely geopolitical analysis. But the upshot seems to be you’re content to watch a dictator bomb his own people and destroy his cities with tanks. If the UN and International Law (agreed upon by a bunch of dictators in the UN) doesn’t provide for a ‘legal’ mechanism to prevent that sort of thing, well then the law doesn’t seem worth a bucket of spit. Look what happened after the ousting of Saddam Hussein! Why do people always want the U.S. to do their dirty work? Why don’t you ask countries like France, U.K. or Libya’s former colonial ruler, Italy! Thank you for those reflections, it’s reassuring to know that there are voices such as yours in this debate. I’m afraid the agitation for Davies to resign is going to be seen in retrospect as part of the drift to war, along with the referral to the ICC and Hague’s revocation of diplomatic privileges – both moves which were either wildly premature or idiotically provocative. As for the prospects for WWIII, I think Obama is our best hope; I read somewhere that he’d more or less told Cameron (and Clinton?) to stop talking up military intervention (a.k.a. aggressive war). I don’t agree with point 7, though; even if the Egyptians choose as badly as the Iranians did when they got rid of their American-backed despot, the fact that they’re now able to make that choice is worth celebrating. Brian writes: Thank you for this, Phil. I take your point about the welcome opportunities that are opened up by the deposition of a tyrant. I wonder, though, whether it will be the Egyptian people who will be allowed to decide what kind of régime shall replace Mubarak, or whether in practice that choice will be made by the army — perhaps by whichever general or colonel emerges on top following a secret power struggle within the military. What succeeded King Farouk’s reign? Not a parliamentary democracy but personal autocratic rule by first General Neguib and subsequently Colonel Nasser (although admittedly they both probably enjoyed broad popular support, anyway to begin with). “The people” were able to overthrow Mubarak only because the army refused to use lethal force against the demonstrators. “Political power grows from the barrel of a gun,” as an expert on the subject famously remarked. Many thanks for drawing my attention to Jon Leyne’s comments. What a pity he spoiled it by referring to ‘The’ HMS York – a BBC reporter should know better. Sorry, being pedantic! Brian writes: Thank you for this engagingly subtle point, Tim. You sent me hastily back to my second update to check whether I had committed the same blooper by referring to “the” HMS Cumberland. By some miracle, I hadn’t. I would have thought 99% of your comments would, in a sane world, be regarded not as unpopular but as simple common sense – but then we don’t live in a sane world. Is it only old age that conveys common sense these days? I don’t need to expatiate on the 1%. I can’t disagree with anything you’ve written. I might merely add that it was extremely inadvisable (although understandable) for Government figures to prate about the imminent demise of Gadaffi. If, as seems plausible, he is able to repress the opposition and remain in at least partial control of the bulk of the country and I assume its oil then it seems to me there are at least two potential unintended consequences from this rashness – first that , believing himself betrayed by the West to whom he turned, he reverts to his earlier practices of a generic and indiscriminate trouble making; second western powers are forced to intervene and depose him simply because of their self- fulfilling prophecies. I’m not sure that the remaining Arab regimes (nor indeed China and Russia) would find his deposition palatable so by our rash and impotent hand wringing the UK Government may find it has achieved the worst of all possible worlds, when judicious silence would have served it better. Not a glorious position to be in but one which Real Politik dictates. Among other things, the statistics for Libyan oil importers cast interesting light on the degree of enthusiasm of various countries for military action against Gaddafi: oil imports as percentages of total Libyan oil exports, Italy 28%, China 11%, Germany and Spain 10% each. On the other hand, France (a whopping 15%) is hugely enthusiastic about a no-fly zone and so is the UK (only 4%), whereas the US (a mere 3%) is distinctly cool, as is Germany. Russia, which of course is an oil and gas exporter, would no doubt see some advantage in a conflict between Libya and the west since if the west loses its access to Libyan oil, that will increase its dependency on Russian energy supplies. Similarly China, with its ravenous and growing appetite for oil and gas imports, would stand to benefit by a reduction in the number of competitors for Libyan oil. The question why our own government in the UK should be spoiling for a fight with the régime in Libya which at present controls most of the country’s oil is to me entirely baffling, especially when a western conflict with Gaddafi is most unlikely to do anything whatever to help the rebels unless we are willing to launch a major Normandy-landing-type invasion with ground forces. Which we most certainly are not. Brian thanks for the pointers. One additional comment that occurs to me is that the Prime Minister’s touch in foreign affairs may be suspect. As Leader of the Opposition, his intervention over the provocation of Russia by a Georgian Government tempted(? )/led astray (?) by promises of support, including NATO membership was injudicious to say the least. His statements on Libya, now as the Head of the UK Government, seem to me to be much the same in nature. Once is perhaps inexperience; twice poor judgement? Brian writes: Thank you, Richard. I very much agree. I suspect that habits learned in opposition die hard when Cameron finds himself a head of government, including not least the rush to seize the headlines with a striking comment without really thinking through the likely consequences, and seemingly without first taking the advice of colleagues and more experienced officials. His background in public relations probably drives this tendency too. It doesn’t apply only to his responses in foreign affairs, but it stands out more sharply in foreign affairs because in that area he has no means of controlling events that follow on after he has shot from the hip (and himself in the foot). The truth is that he’s extremely shallow and impulsive, and obsessed with giving an impression of leadership and quick response — a very risky combination. Too many echoes of the worst sides of Blair, as well: not a safe role model. Really the situation in Libya and Middle East created new financial and crude oil crisis, which in my eyes will be harder than the one happened last year. Terrible, but such dictators should be removed from the governments. Brian writes: Thank you for this. Sadly, I agree. It looks as if it could well end in tears. The situation has been transformed by various new factors: the Arab League has called for intervention and a couple of Arab countries have apparently promised to participate in the military action against Gaddafi; the Americans have come round to support for it, probably influenced by the Arab League appeal and after talking to the Russians; the Russians and the Chinese agreed not to veto, just to abstain; the Arab member of the Security Council actually co-sponsored the UK-French resolution in the Council; the terms of the resolution were hugely expanded to go well beyond a mere no-fly zone, which would have been futile; and above all, military action now has the authority of the Security Council and thus of international law. It remains, however, an enormous gamble. I’ll have more to say after hearing Cameron’s triumphalist statement in the house of commons in two minutes’ time. Next story Libya: Fine, but why Britain?